I’ve been a fan of Edith Wharton’s novels for over 15 years, so I jumped at the chance to participate in this tour, and am glad it compelled me to read one of several Wharton books that I already owned but hadn’t previously read. 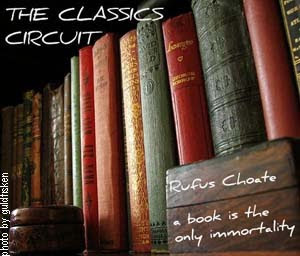 Many, many thanks to Rebecca Reid for bringing us The Classics Circuit. To see more “stops” along Wharton’s tour, click here. First, a smalI confession: I just finished reading The Children two days ago, my tour date is tomorrow (I’m writing on the evening of 1/27), and I don’t know how I can get enough coherent thoughts together to really do justice to the book. I feel like I could spend a week writing about it, yet in the limited time I have, I’m not sure where to start. I fear I’ll just share my impressions as I think of them, and it will be a jumbled mess. This should not reflect upon your opinion of the book, as Wharton is too polished and intelligent to make a jumbled mess of anything. A bestseller when it was first published in 1928, The Children is a comic, bittersweet novel about the misadventures of a bachelor and a band of precocious children. The seven Wheater children, stepbrothers and stepsisters grown weary of being shuttled from parent to parent “like bundles,” are eager for their parents’ latest reconciliation to last. A chance meeting between the children and the solitary forty-six-year-old Martin Boyne leads to a series of unforgettable encounters. Martin Boyne meets the Wheater children on a cruise, when he and the eldest child, Judith Wheater, find themselves seated together on deck. From the moment Boyne first sees Judith, he is awed by her maturity and self-assurance. He can’t tell if she is mother or step-mother to one of more of the other children, or a governess, because she looks quite young, but directs the whole brood as though she were their mother. As the true governess, Miss Scope, soon tells Boyne, “Judith’s never been a child – there was no time.” Judith’s parents, Cliffe and Joyce Wheater, had frequent arguments throughout their marriage, and after having three children – a twin brother and sister, Terry and Blanca, coming a few years after Judith – they divorced, and married other people. After those unions went wrong, they reconciled and remarried, and had a fourth child, the toddler Chip. The other three children are what Judith calls “the steps,” step-children from the other relationships. One of the girls is actually a half-sibling, fathered by Cliffe Wheater, but the other two are Joyce’s step-children, not related to the Wheaters by blood, but part of the family just the same. Throughout the book, Judith’s primary goal is to keep all seven children together. This is easier to do if Cliffe and Joyce Wheater remain together, even if they themselves are on a perpetual honeymoon and leave most of the childcare to the governess, the nurse, and Judith. But their relationship has always been volatile, and they both have wandering eyes. Moreover, they’re rich enough to live in hotels and send their children away on a cruise with their paid caretakers. In many ways, the Wheater parents are less mature than the Wheater children, and certainly less mature than their daughter Judith. Martin Boyne was friendly with Joyce Wheater in their youth, and was also acquainted with Cliffe Wheater in college. These loose, long-ago connections, combined with Judith’s singular personality and Boyne’s genuine sympathy for the children’s situation, cause Boyne to befriend Judith and all the children, and to become their supporter and ally in their attempts to remain together. I should add that Boyne is not the only adult who comes to believe that Judith’s view is the most beneficial for the other children; we soon find that Miss Scope and the nurse also take their directions from Judith without hesitation. It is not surprising that Martin Boyne develops romantic feelings for Judith Wheater, as she has strength, wisdom, and determination far beyond her fifteen years. Wharton has created a very appealing character in Judith, and I found myself drawn to her, hoping she’d succeed in keeping all the children together. Boyne’s feelings for Judith are complicated: he does sometimes see her as the child she still is, and even when his fiancée says she believes he’s in love with Judith, he dismisses the idea, and insists that “Judith’s as much a child to me as the others.” But she isn’t really, because she’s made herself responsible for the rest of them, and if Boyne is to help the children, he must confer with Judith about every change in the family’s situation — and that is what he does. Wharton develops the relationship between Boyne and Judith with delicacy and great skill. For a long time, Boyne seems truly not to realize that his feelings are changing, and never seeks to take advantage of Judith in any way. For her part, Judith likes Boyne a great deal, but although she calls him “dear” and “darling” multiple times (which I figured must be common for that time period, their class, and their usual society), it never occurs to her that his feelings for her are anything but friendly and paternal. She may often behave like a woman, but Wharton reminds us in many small ways that Judith isn’t a grown-up yet. Part of what draws Boyne to Judith, and to all the children, is the way they make him feel younger. Unlike the Wheaters and their set, and unlike his fiancée, Rose, Boyne has never been married. He is middle-aged, but not yet old; the sense of adventure and possibility is palpable when he’s with the Wheater children. The Children is not quite on the same level as some of Wharton’s more famous works, but the story held my interest, the characters were well-drawn and most were sympathetic, and the writing is great, as we’ve come to expect from Edith Wharton. I feel as though I too met the Wheater children, and had a very enjoyable time with them. Sounds like an interesting story; not one I've heard of before. If Wharton was writing today, I doubt that she'd have a 46-year old guy interested (in whatever way) in a 15- year old girl even if she was mature beyond her years. I have a friend who was basically "mother" to her several younger siblings while she was growing up; and it made her decide never to have children of her own. Hi Valerie — That's interesting about your friend, and probably not too surprising. It reminded me, there were a few times in the book where Judith said she didn't think she'd ever marry, because then what would happen to the children?? She always viewed herself as both connected with them AND taking care of them. I was not familiar with this one at all, so thanks for the background info. Sounds like an interesting group of characters.